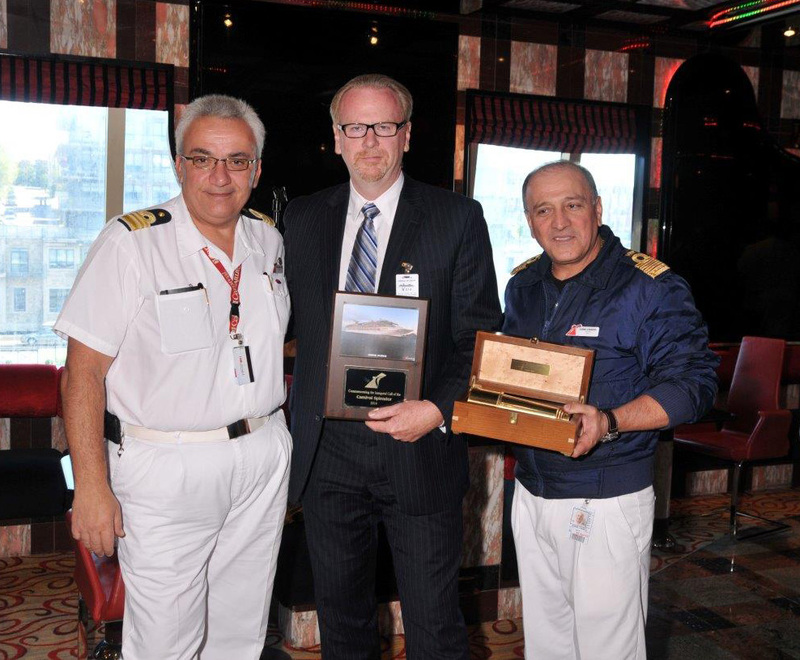 Carnival Splendor officers and Port of Saint John officials held a reception on board earlier this week to celebrate another successful cruise season during which the ship brought more than 30,000 visitors to the charming eastern Canada port. Carnival Splendor Hotel Director Nickos Batistatos (left) and Captain Carmelo Marino (right) and are pictured during the ceremony with Saint John Port Authority Vice Chairman Andrew Dixon. Marino was presented with a traditional nautical telescope by Dixon who received a special commemorative maritime plaque in return. Carnival Splendor visits Saint John as part of its four-, five- and seven-day cruise schedule from New York.